The Khalil Mamoon Basha Two Hose is a larger Traditional hookah model that features unique gold and copper accents and is designed specifically for producing a great smoking experience. Although this model is a multi-hose shisha pipe upon purchase as a 2 Hose model it can be converted into a single hose model as well. This handmade Egyptian hookahs durable design allows for ease with setup and maintenance. Basha Two Hose hookah pipes come as a complete hookah set including Hookah Tongs, Clay Bowl, Cleaning Brush Set, Rubber Grommets, Two KM Long Handle Rainbow Hose, Plastic Mouthpiece, and Setup Instructions. This narguile may be used for both decorative and smoking pleasures, providing entertainment for years to come. 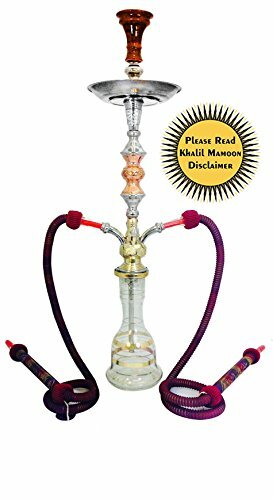 This Khalil Mamoon brand Traditional Narguile Pipe has multi hose capability and may be converted from a 2 Hose model into a single hose model. All KM Traditional Hookah Pipes Are Unique. The Stem, Vase, And Hose Patterns and Colors May Vary from the Color Selections and Photograph Listed Above due to them being handmade in Egypt.